HEARTS by Thereza Rowe (2014). This is put out by TOON Books, a very cool publisher of comic picture books that kids can read on their own. On their own! Even at three years old. Why? Because they’re told visually and with minimal, simple words. And YET. This book is not simple at all. It invites readers to come up with their own narrative interpretations. It’s kind of a wild ride! 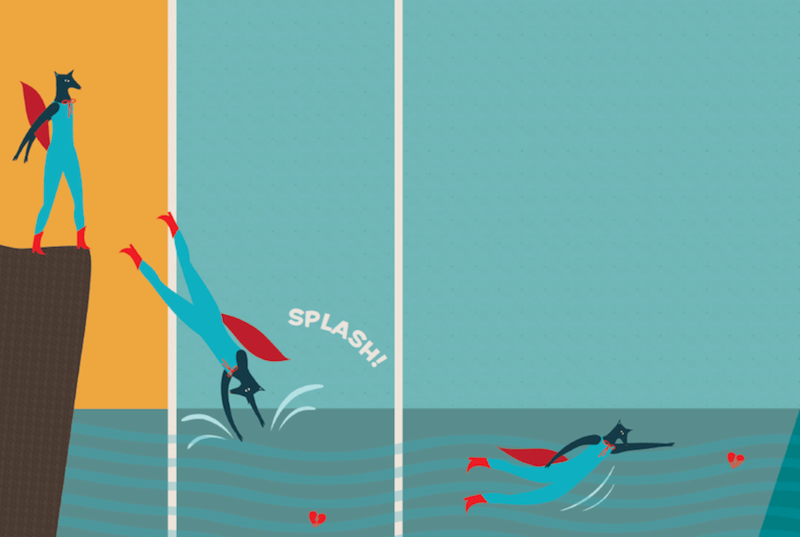 And the art is impeccable thanks to Thereza Rowe‘s bold, beautiful, graphic creations. I like how this book is about love, one’s heart, but it’s really about the friendship kind of love. Penelope the fox’s best friend takes off in a rocket (of course! )—but at least she’s got a stack of books with her. Penelope’s heart is broken in two with the loss. 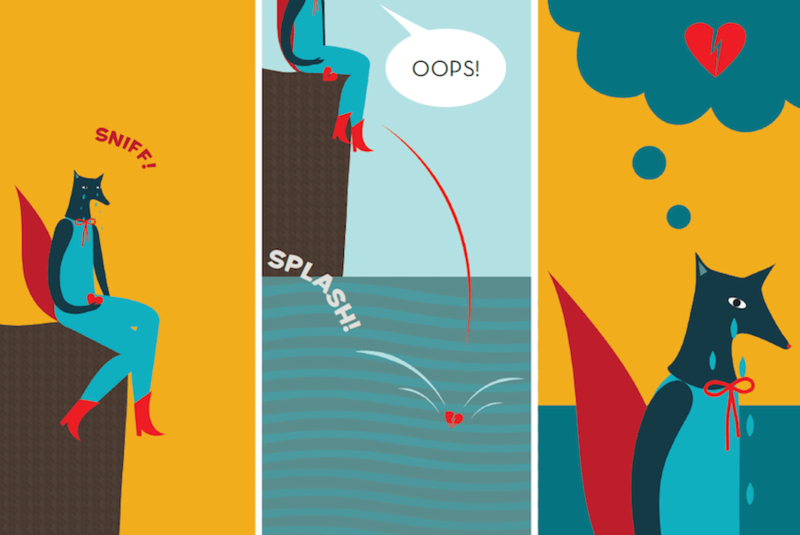 And then, oops, she drops her heart in the ocean! From there, it’s an adventure story of Penelope chasing after her heart with dolphins, seagulls, armed guards, a helpful horse, and more along the way. 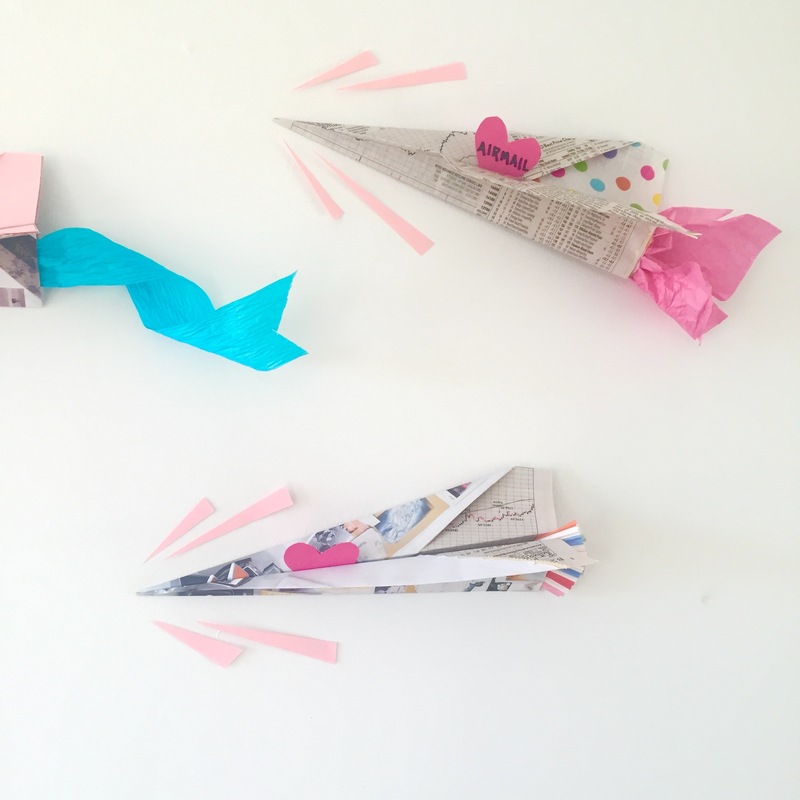 Keep that newspaper airplane in mind for craft time! 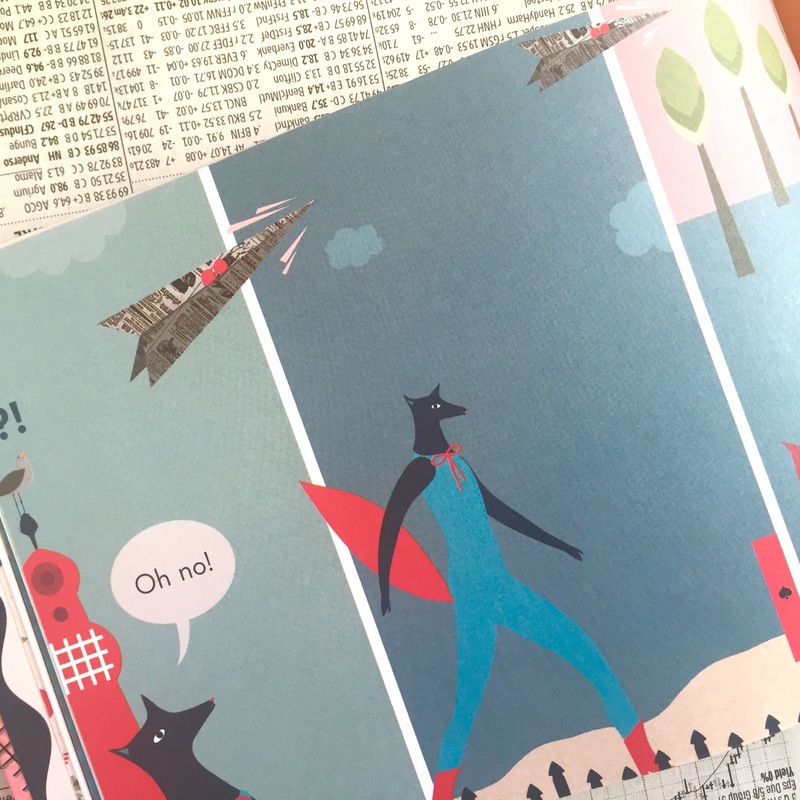 You’ll appreciate hints of Alice in Wonderland, superheroes, fairy tales, mid-century modernism, elements of Mary Blair, along with all things whimsical. Images via Thereza Rowe and TOON Books. This book was immediately my pick for a Valentine’s Day craft. And why, you ask? 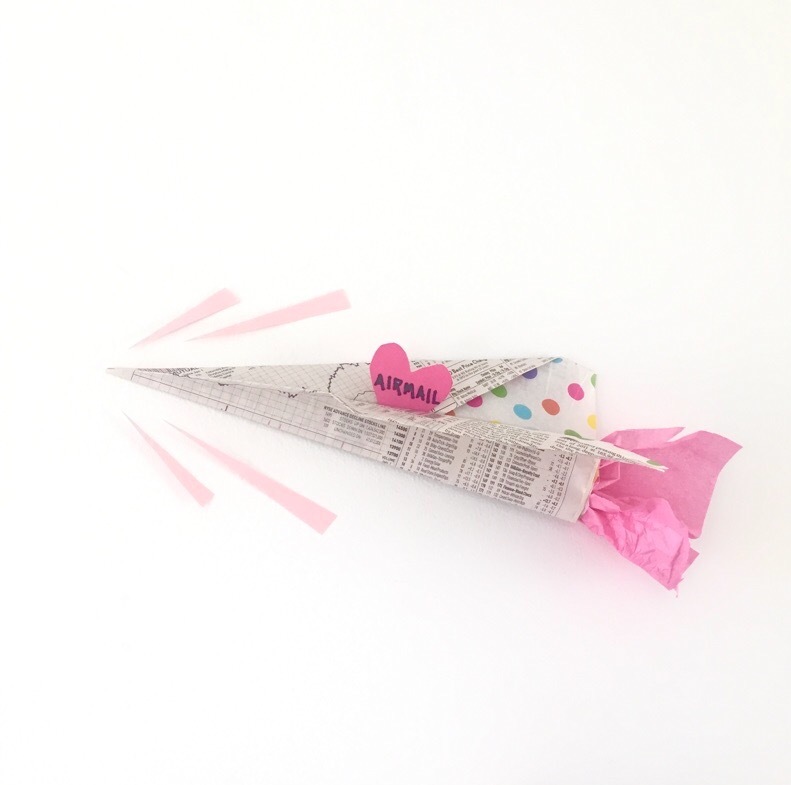 The paper airplane made from newspaper that carries Penelope’s heart! In the sky, over the trees, and into a castle. It’s super simple. 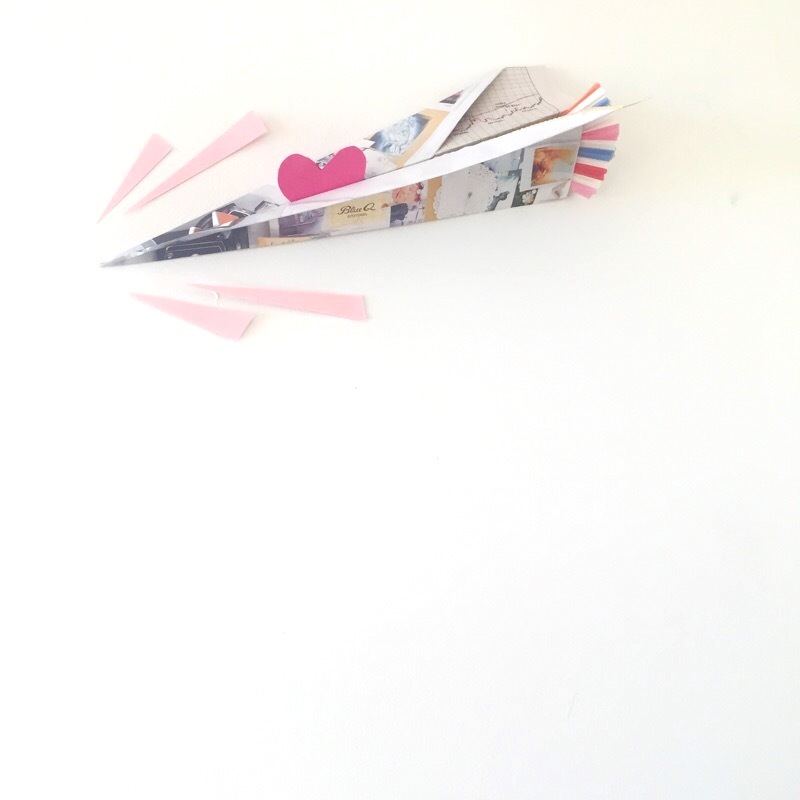 Make a paper airplane and put a heart in it to be carried away. 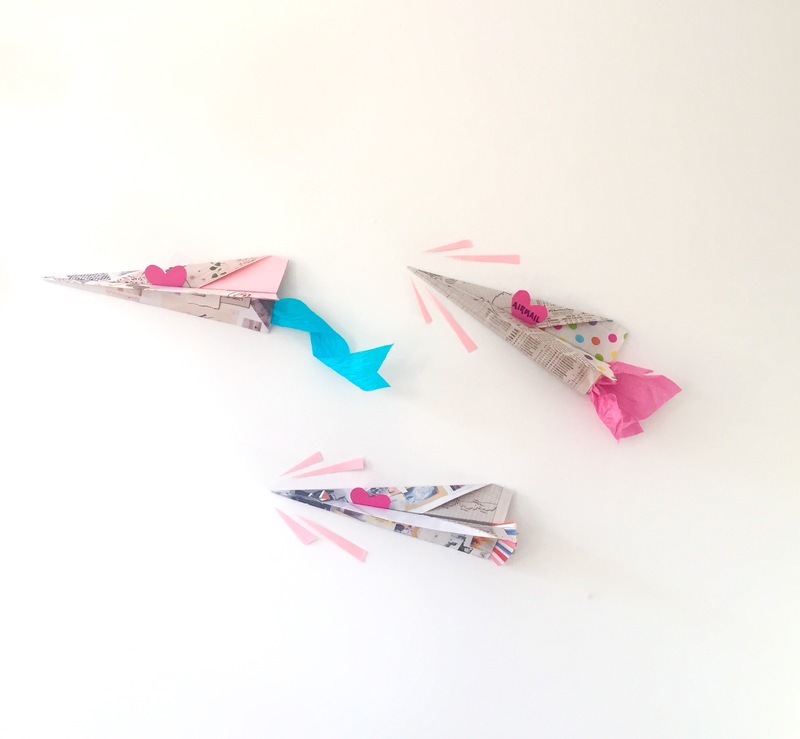 (I love the idea of kids launching these around a room at each other!). You can keep it simple or make it as fancy as you want. 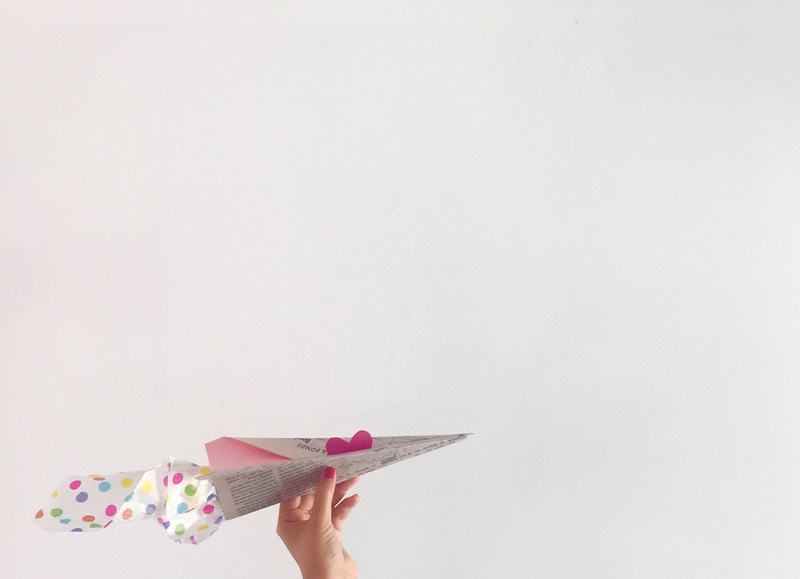 We lined our airplanes with another paper for a pop of color or pattern on the inside. Then we made exhaust tails out of whatever was on hand—pretty tissue paper, blue accordion ribbon. 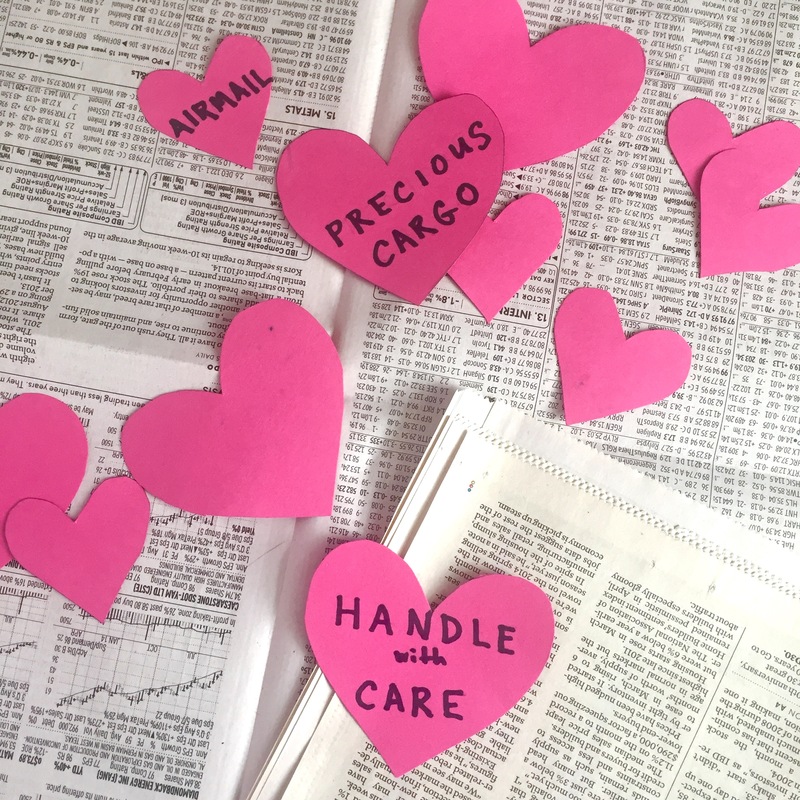 Cut out some hearts in whatever color you like, write a message (preferably aviation or postal related) and voila! Your valentine is ready to send! And that’s how you send a heart, picture book style. I’m giving away a copy of HEARTS over on twitter! Come find me there to enter! 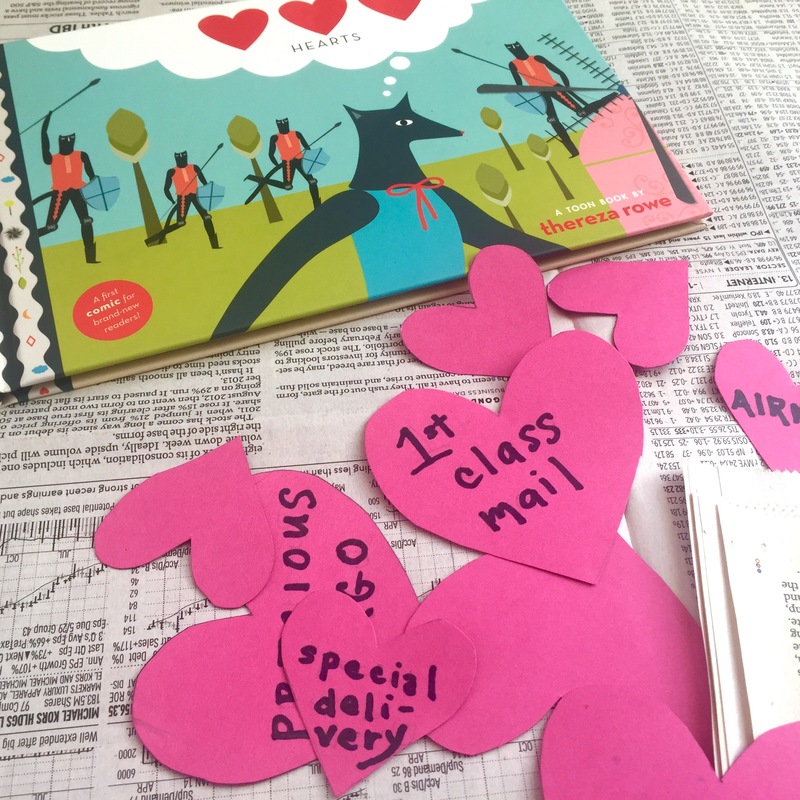 read the book, make a paper airplane valentine! Wonderful post on what looks like a wonderful book. 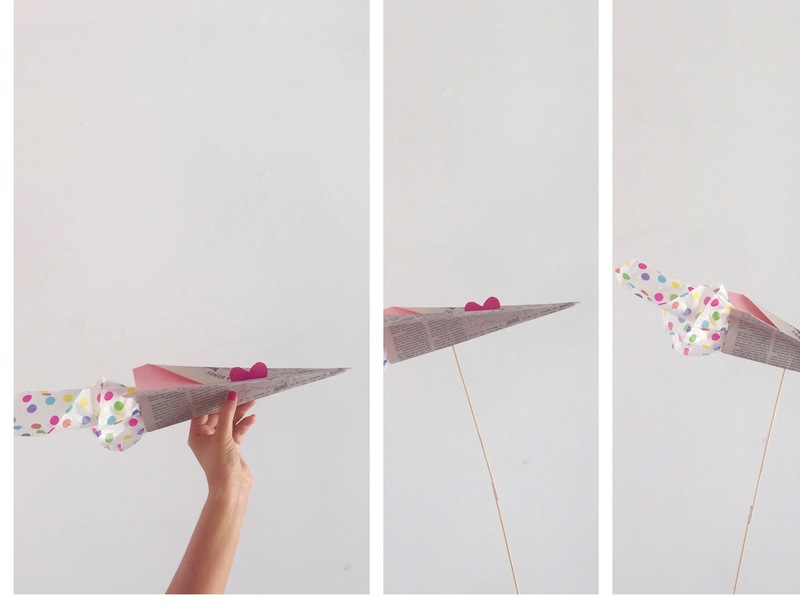 The paper airplane idea looks like great fun. I hope to try it soon. Love the airplane idea! Those are so cute. The book looks great, too. My dude and I had SO much fun making these. And it honestly took only about a half an hour for them to be ready for takeoff! I’m thinking that this is a valentines activity that my son might still be interested in. He could use red and yellow cellophane to make the flames coming out the back of the plane. And then he cold tape a secret message inside the plane. Hmmmm. Will have to run this by him. The illustrations are boldly drawn, and I love the vibrant colors. The “heart chase” really pulls me into the story. Smashing idea with the planes, but I also like Jilanne’s take too! Toon book is also smashing! What fun all around!! The story reminds me of Madame Chapeau! Thanks for sharing! !